Three ladies from NYC have made a tumultuous album, complete with ambient stoner rock tendencies and acidic musical passages. The name of the band is Bottom, and You're Next is the name of the 13-track release. Laden with atmospheric textures much like a Sunn 0))) or Melvins release, tracks like the avant-garde "Distordo II" and "Requiem" are slow, sludgy, and dirge-like, perfect for the soundtrack to your funeral. 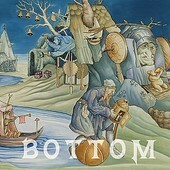 Dark and foreboding, Bottom's latest album will rumble the fillings in your mouth and shake your brain silly, even as they throw down a seemingly harmless yet totally left of center blues jam like "Rainy Day Blues".